The inference of genetic regulatory networks from global measurements of gene expressions is an important problem in computational biology. Recent studies suggest that such dynamical molecular systems are poised at a critical phase transition between an ordered and a disordered phase, affording the ability to balance stability and adaptability while coordinating complex macroscopic behavior. We investigate whether incorporating this dynamical system-wide property as an assumption in the inference process is beneficial in terms of reducing the inference error of the designed network. Using Boolean networks, for which there are well-defined notions of ordered, critical, and chaotic dynamical regimes as well as well-studied inference procedures, we analyze the expected inference error relative to deviations in the networks' dynamical regimes from the assumption of criticality. We demonstrate that taking criticality into account via a penalty term in the inference procedure improves the accuracy of prediction both in terms of state transitions and network wiring, particularly for small sample sizes. The execution of various developmental and physiological processes in cells is carried out by complex biomolecular systems. Such systems are dynamic in that they are able to change states in response to environmental cues and exhibit multiple steady states, which define different cellular functional states or cell types. The massively parallel dynamics of complex molecular networks furnish the cell with the ability to process information from its environment and mount appropriate responses. To be able to stably execute cellular functions in a variable environment while being responsive to specific changes in the environment, such as the activation of immune cells upon exposure to pathogens or their components, the cell needs to strike a balance between robustness and adaptability. Theoretical considerations and computational studies suggest that many types of complex dynamical systems can indeed strike such an optimal balance, under a variety of criteria, when they are operating close to a critical phase transition between an ordered and a disordered dynamical regime [1–3]. There is also accumulating evidence that living systems, as manifestations of their underlying networks of molecular interactions, are poised at the critical boundary between an organized and a disorganized state, indicating that cellular information processing is optimal in the critical regime, affording the cell with the ability to exhibit complex coordinated macroscopic behavior [4–8]. Studies of human brain oscillations , computer network traffic and the Internet , financial markets , forest fires , neuronal networks supporting our senses , and biological macroevolution have also revealed critical dynamics . A key goal in systems biology research is to characterize the molecular mechanisms governing specific cellular behaviors and processes. This typically entails selecting a model class for representing the system structure and state dynamics, followed by the application of computational or statistical inference procedures for revealing the model structure from measurement data . Multiple types of data can be potentially used for elucidating the structure of molecular networks, such as transcriptional regulatory networks, including genome wide transcriptional profiling with DNA microarrays or other high-throughput technologies, chromatin immunoprecipitation-on-chip (ChIP-on-chip) for identifying DNA sequences occupied by specific DNA binding proteins, computational predictions of transcription factor binding sites based on promoter sequence analysis, and other sources of evidence for molecular interactions . The inference of genetic networks is particularly challenging in the face of small sample sizes, particularly because the number of variables in the system (e.g., genes) typically greatly outnumbers the number of observations. Thus, estimates of the errors of a given model, which themselves are determined from the measurement data, can be highly variable and untrustworthy. Any prior knowledge about the network structure, architecture, or dynamical rules is likely to improve the accuracy of the inference, especially in a small sample size scenario. If biological networks are indeed critical, a key question is whether this knowledge can be used to improve the inference of network structure and dynamics from measurements. We investigated this question using the class of Boolean networks as models of genetic regulatory networks. Boolean networks and the more general class of probabilistic Boolean networks are popular approaches for modeling genetic networks, as these model classes capture multivariate nonlinear relationships between the elements of the system and are capable of exhibiting complex dynamics [51619–21]. Boolean network models have been constructed for a number of biomolecular systems, including the yeast cell cycle , mammalian cell cycle , Drosophila segment polarity network , regulatory networks of E. coli metabolism , and Arabidopsis flower morphogenesis [27–29]. At the same time, these model classes have been studied extensively regarding the relationships between their structure and dynamics. Particularly in the case of Boolean networks, dynamical phase transitions from the ordered to the disordered regime and the critical phase transition boundary have been characterized analytically for random ensembles of networks [30–34]. This makes these models attractive for investigating the relationships between structure and dynamics . In particular, the so-called average sensitivity was shown to be an order parameter for Boolean networks . The average sensitivity, which can be computed directly from the Boolean functions specifying the update rules (i.e., state transitions) of the network, measures the average response of the system to a minimal transient perturbation and is equivalent to the Lyapunov exponent . 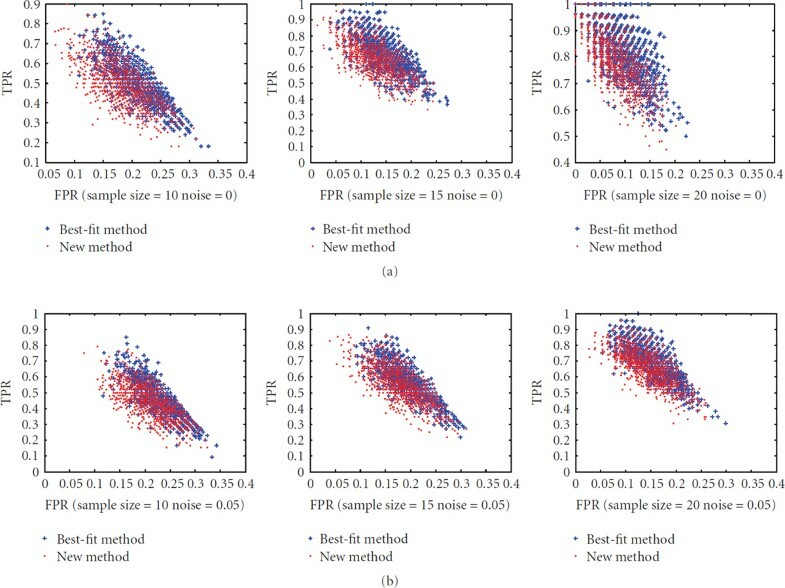 There have been a number of approaches for inferring Boolean and probabilistic Boolean networks from gene expression measurement data [202137–44]. We address the relationship between the dynamical regime of a network, as measured by the average sensitivity, and the inference of the network from data. We study whether the assumption of criticality, embedded in the inference objective function as a penalty term, improves the inference of Boolean network models. We find that for small sample sizes the assumption is beneficial, while for large sample sizes, the performance gain decreases gradually with increasing sample size. This is the kind of behavior that one hopes for when using penalty terms. This paper is organized as follows. In Section 2, we give a brief definition of Boolean Networks and the concept of sensitivity. Then in Section 3, three measures used in this paper to evaluate the performance of the predicted networks are introduced, and a theoretical analysis of the relationship between the expected error and the sensitivity deviation is presented. Based on this analysis, an objective function is proposed to be used for the inference process in Section 4, while the simulation results are presented in Section 5. A Boolean network is defined by a set of nodes , and a set of Boolean functions , . Each node represents the expression state of the gene , where means that the gene is OFF, and means it is ON. Each Boolean function with specific input nodes is assigned to node and is used to update its value. Under the synchronous updating scheme, all genes are updated simultaneously according to their corresponding update functions. The network's state at time is represented by a vector and, in the absence of noise, the system transitions from state to state in a deterministic manner. Sensitivity is in fact a global dynamical parameter that captures how a one-bit perturbation spreads throughout the network and its expectation under the random Boolean network model is equivalent to the well-known phase transition curve . There are several ways to measure the performance of an inference method by comparing the state transitions, wiring, or sensitivities with the original network. In this paper, we will use three measures that are described below. where denotes the normalized error of the predicted function . Additionally, and are extended such that they are functions of all the variables (instead of variables) by adding fictitious (i.e., dummy) variables. where TP and FP represent true positive and false positive instances, respectively, while and represent the total positive and negative instances, respectively. We will use the ROC distributions to evaluate the accuracy of "wiring" (i.e., the specific input nodes assigned to each node) for the inferred network. where is the sensitivity of the predicted network. This means that the expectation of the state transition error generally depends on the original network's connectivity , its sensitivity , the sensitivity deviation , and the mean quadratic terms of the bias deviation . In this case, will have a linear relationship with . This indicates that will surely introduce additional error . Our simulations indicate that the inference method we use (best-fit, see below) yields a network with in most cases. To infer a Boolean network, for each target node we need to apply some optimization criterion to each set of input variables and Boolean function on those input variables and then choose the variable set and corresponding Boolean function that minimizes the objective function. The first step in our proposed procedure is to find variable sets and Boolean functions that provide good target prediction. Based upon time-series observations, given a target node and an input-node vector the best predictor, , minimizes the error, , among all possible predictors . Finding the best predictor for a given node means finding the minimal error among all Boolean functions over all input-variable combinations. We consider three variable combinations. Since we will optimize via an objective function containing a sensitivity penalty term, we will select a collection of input-variable sets and select the minimal-error Boolean function over each input-variable set. This is accomplished by using the plugin (resubstitution) estimate of the error , which is given by the number of times in the data divided by the number of times, the pair is observed in the data. This procedure is equivalent to the best-fit extension method . 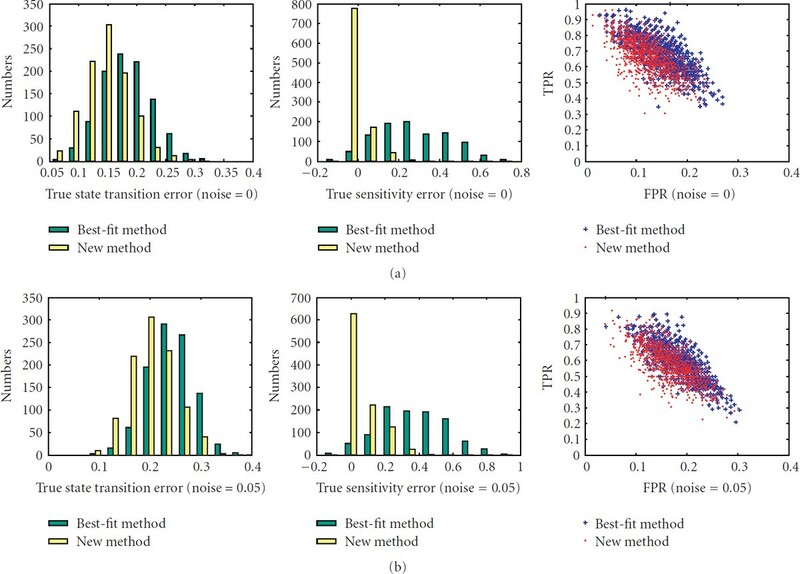 We make use of an efficient algorithm for solving the best-fit extension problem and finding all functions having error smaller than a given threshold . We then select the four best variable sets and corresponding Boolean functions as candidates. The limitation of four candidates is based on computational considerations; in principle, there is no such limitation. where is the original resubstitution estimate. We summarize the procedure as follows. For each three-variable set , do the following. Compute the resubstitution errors of all Boolean functions using the full sample data set. Choose the Boolean function, , possessing the lowest resubstitution error as the corresponding function for . Bootstrap the sample and compute the zero-bootstrap error estimate for . Compute the .632 bootstrap error estimate for using the computed resubstitution and zero-bootstrap estimates. Select the four input-variable sets whose corresponding functions possess the lowest .632 bootstrap estimates. This procedure is the same as the one used in  to evaluate the impact of different error estimators on feature-set ranking. 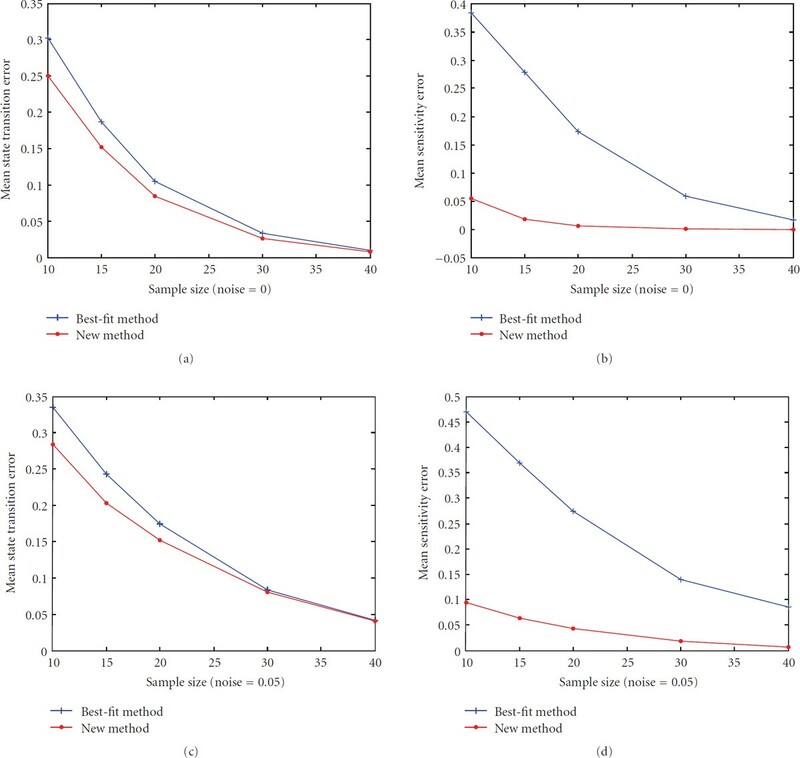 It was demonstrated there that the bootstrap tends to outperform cross-validation methods in choosing good feature sets. While it was also observed that bolstering tends to be slightly better than bootstrap, bolstering cannot be applied in discrete settings, so it is not a viable option in our context. where represents the bootstrap-estimated error of the previously selected Boolean function and is the sensitivity error. The first item represents the prediction error, while the second represents the "structural error" associated with general network dynamics. Our hypothesis is that a better inference should have a small error in both state transition and sensitivity, and consequently, the value of its objective function should be minimal. Of the four input-variable sets selected via prediction error for a target node, we use the one with minimal objective function for network construction. All simulations are performed for random Boolean networks with and . For a given BN, we randomly generate pairs of input and output states. We also consider the effect of noise, with 5% noise added to the output states of each gene by flipping its value with probability 0.05. From the perspective of network inference, performance is best characterized via a distance function between the ground-truth network and the inferred network, more specifically, by the expected distance between the ground-truth and inferred network as estimated by applying the inference to a random sample of ground-truth networks . In our case, we have chosen the normalized state-transition error as the distance between the networks. First, we investigate the performance of the new method on networks with different sensitivities, , on sample sizes ranging from 10 to 40. There are total of 200 networks for each value of the sensitivity. 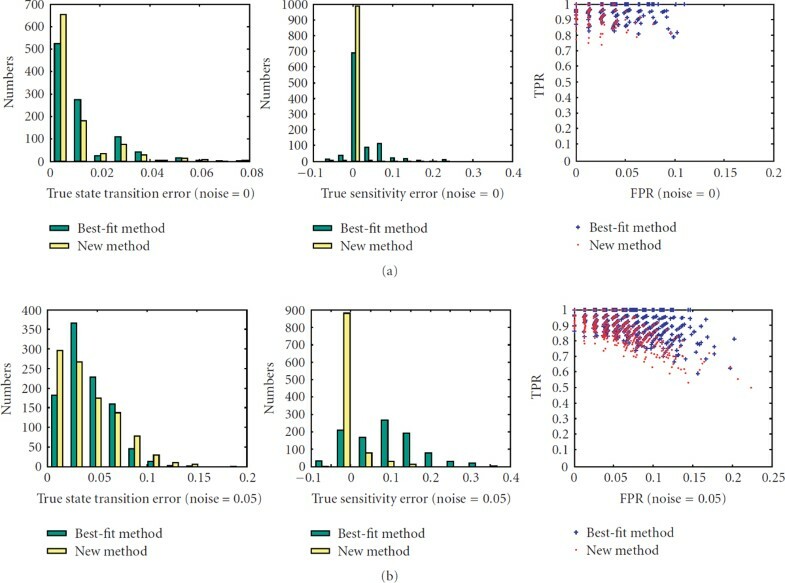 The left columns of Figures 1–5 are the histograms of the distribution of the true state-transition error (Section 3.1.1) for both the traditional best-fit method (combined with .632 bootstrap) and the new proposed method. They show that the proposed method reduces this error dramatically in small sample situations. As sample size increases, the performance of both methods becomes closer. The middle columns of Figures 1–5 are the histograms of the distribution of the sensitivity error (Section 3.1.3). 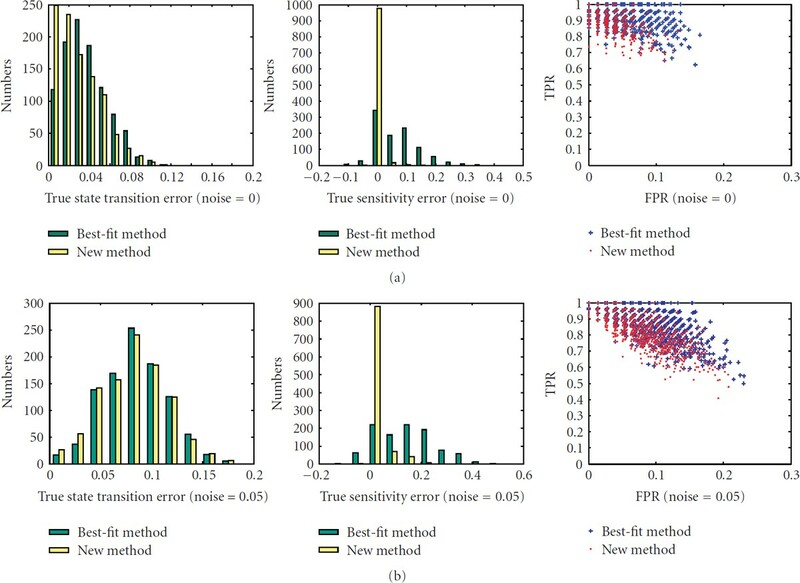 As can be seen, the best-fit method usually ends up with a network with larger sensitivity in small sample cases, while the proposed method can find a network operating in the same or nearby dynamic regime. The right columns of Figures 1–5 are the ROC distributions of both methods (Section 3.1.2). The proposed method has approximately the same TPR as the best-fit method but with a lower FPR. This means that the recovered connections will have higher reliability. Figure 6 shows the mean error in state transition and sensitivity under different samples sizes, for zero noise and 5% noise. Histograms of the true error in state transition and in sensitivity and the ROC distribution for the 1000 random BNs under sample size 10. Histograms of the true error in state transition and in sensitivity and the ROC distribution for the 1000 random BNs under sample size 15. Histograms of the true error in state transition and in sensitivity and the ROC distribution for the 1000 random BNs under sample size 20. Histograms of the true error in state transition and in sensitivity and the ROC distribution for the 1000 random BNs under sample size 30. Histograms of the true error in state transition and in sensitivity and the ROC distribution for the 1000 random BNs under sample size 40. Mean state transition and sensitivity error for sample sizes ranging from 10 to 40, computed with zero noise and 5% noise. In practice, we do not know the network sensitivity, so that the assumed value in the inference procedure may not agree with the actual value. Hence, the inference procedure must be robust to this difference. Under the assumption of criticality for living systems, it is natural to set in the inference procedure. Moreover, assuming that a living system remains near the border between order and disorder, the true sensitivity of gene regulatory networks will remain close to 1 under the Boolean formalism. Thus, to investigate robustness, we generated 1000 networks with sensitivities , and then inferred them using with the proposed method. 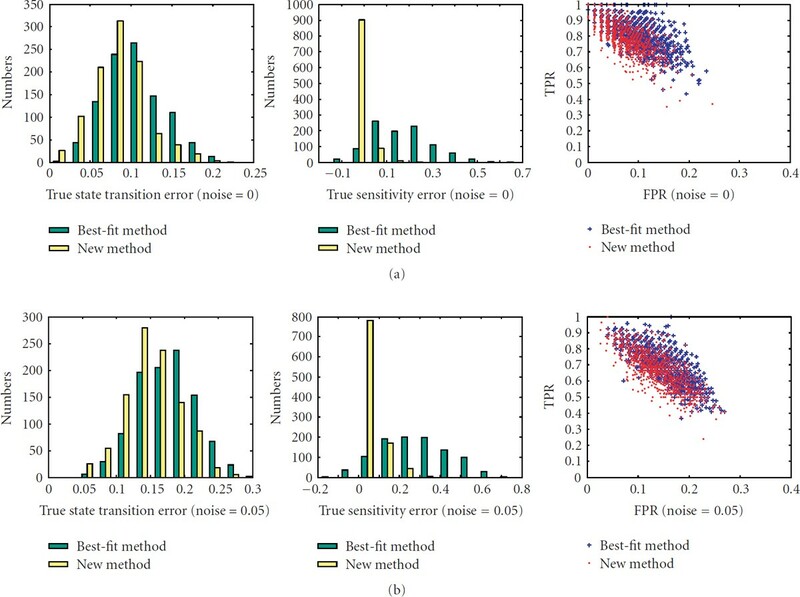 The mean state transition errors of both methods are shown in Figure 7. Mean state transition error of different sensitivity deviation for sample sizes ranging from 10 to 70, computed with zero noise and 5% noise. When the actual sensitivity is 1, the method helps for small samples and the performances become close for large samples, analogous to Figure 6. When the true network deviates from the modelling assumption, , the proposed method helps for small samples and results in some loss of performance for large samples. This kind of behavior is what one would expect with an objective function that augments the error. In effect, the sensitivity is a penalty term in the objective function that is there to impose constraint on the optimization. In our case, when the true sensitivity is not equal to 1, the sensitivity constraint yields smaller sensitivity error than the best-fit method in small sample situations, while the sensitivity error of the best-fit method is smaller for large samples. In sum, the constraint is beneficial for small samples. Finally, the performance of the new method with regard to wiring for small sensitivity deviation is presented in Figure 8. It shows that the new method can achieve the same TPR with a lower FPR under a small sensitivity deviation in small sample situations. The distribution of ROC with sensitivity deviation from 0.9 to 1.1 for sample sizes 10, 15, and 20, computed with zero noise and 5% noise. Sensitivity is a global structural parameter of a network which captures the network's operating dynamic behavior: ordered, critical, or chaotic. Recent evidence suggests that living systems operate at the critical phase transition between ordered and chaotic regimes. In this paper, we have proposed a method to use this dynamic information to improve the inference of Boolean networks from observations of input-output relationships. First, we have analyzed the relationship between the expectation of the error and the deviation of sensitivity, showing that these quantities are strongly correlated with each other. Based on this observation, an objective function is proposed to refine the inference approach based on the best-fit method. 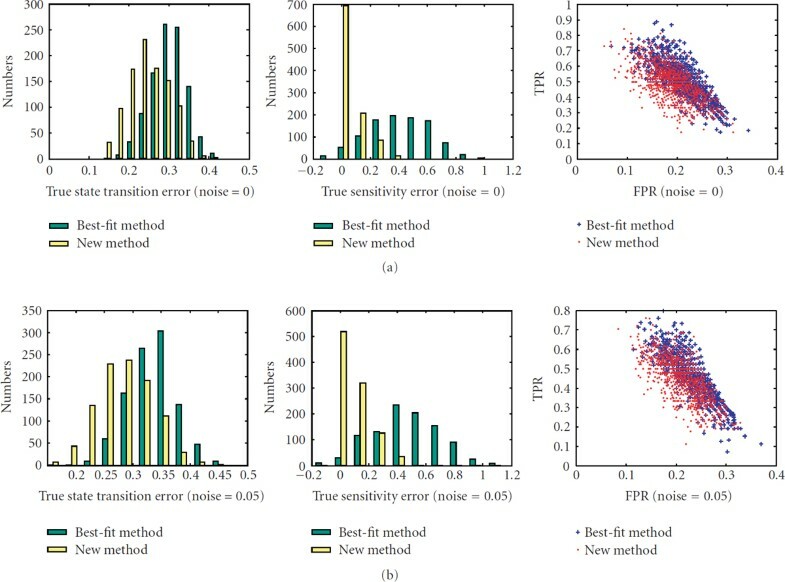 The simulation results demonstrate that the proposed method can improve the predicted results both in terms of state transitions, sensitivity, and network wiring. The improvement is particularly evident in small sample size settings. As the sample size increases, the performance of both methods becomes similar. In practice, where one does not know the sensitivity of the true network, we have assumed it to be 1, the critical value, and investigated inference performance relative to its robustness to the true sensitivity deviating from 1. For small samples, the kind we are interested in when using such a penalty approach, the proposed method continues to outperform the best-fit method. For practical applications, one can apply an optimization strategy, such as genetic algorithms, to attain suboptimal solutions instead of the brute force searching strategy used in this paper. As the final chosen function for each gene generally lies within the top three candidates in our simulations, one can just select from a few top candidate functions for each gene instead of using all of the possible candidates. Finally, it should be noted that the ideas presented here could also be incorporated into other inference methods, such as the ones in . Support from NIGMS GM072855 (I.S. ), P50-GM076547 (I.S. ), NSF CCF-0514644 (E.D. ), NCI R01 CA-104620 (E.D. ), NSFC under no. 60403002 (W.L. ), NSF of Zhejiang province under nos. Y106654 and Y405553 (W.L.) is gratefully acknowledged.